Have anyone try Calpis drink before? Calpis is Japan’s first cultured milk drink has gained popularity in Malaysia market. The brand pulled another unprecedented fun-filled campaign that aimed to advocate a healthier lifestyle through maintaining a good and healthy digestive system. 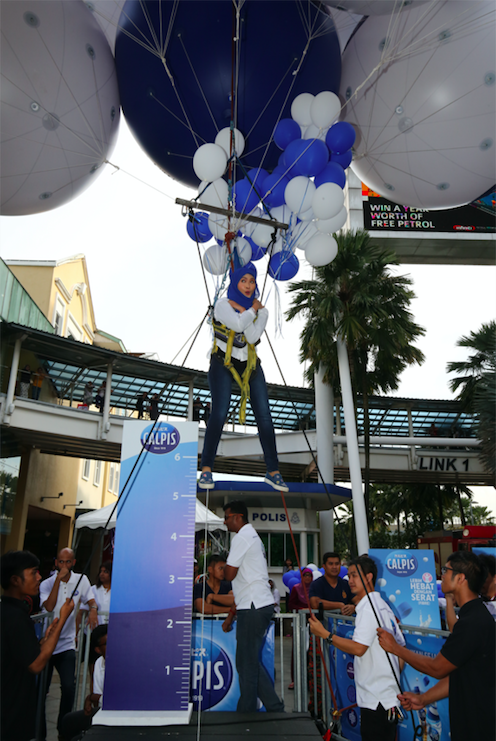 For the first time ever, the campaign involved iconic Malaysian celebrities and Calpis ambassadors such as Harith Iskander (Laugh Factory Funniest Person in The World 2016), Zizan Razak (actor and comedian) and Siti Nordiana (singer) being lifted in mid-air with helium balloons at eCurve Mutiara Damansara, making it the first ever cultured milk brand to host such an extraordinary campaign. 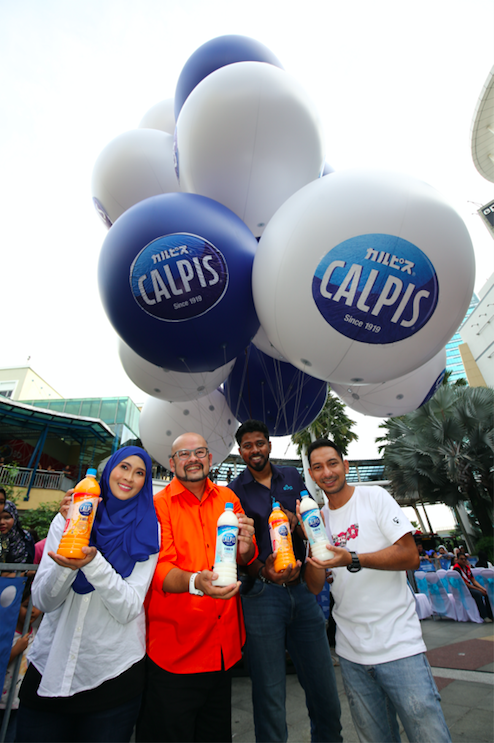 As part of the extraordinary feat and in an effort to spread more goodness to Malaysians, Calpis invited members of the public to be part of the uplifting experience via a social media contest. All Malaysians needed to do was to guess the number of helium balloons that it took to lift the ambassadors by watching the actual event via livestream on Facebook Live. A total of RM15,000 cash prizes were rewarded to 150 individuals by the end of the Facebook livestream! That cool and I going to join the contest too. 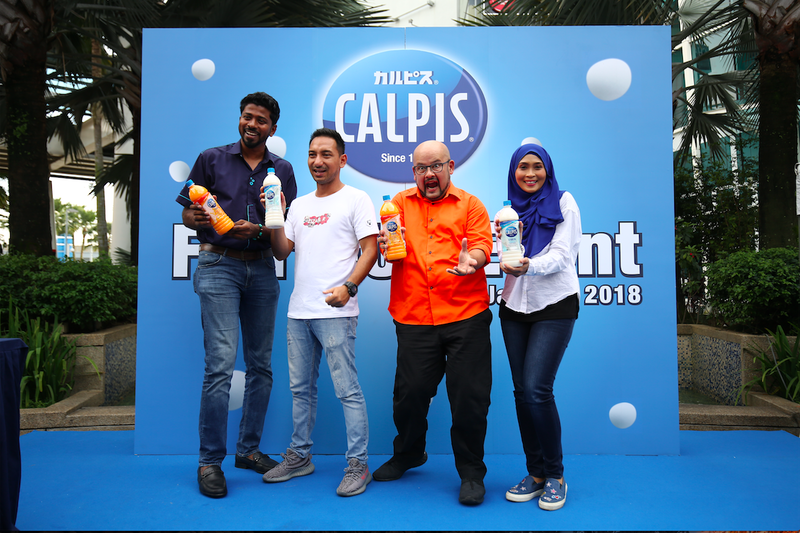 Many Malaysians tuned in to watch the actual lifting that showcased how ‘light’ one feels upon consuming Calpis Fibre range – a key point as Calpis Fibre promotes gut-health combined with a dose of deliciousness. “I am thrilled to be part of this whole Calpis Fibre campaign. It was my first time being lifted with helium balloons and it was such a cool experience! 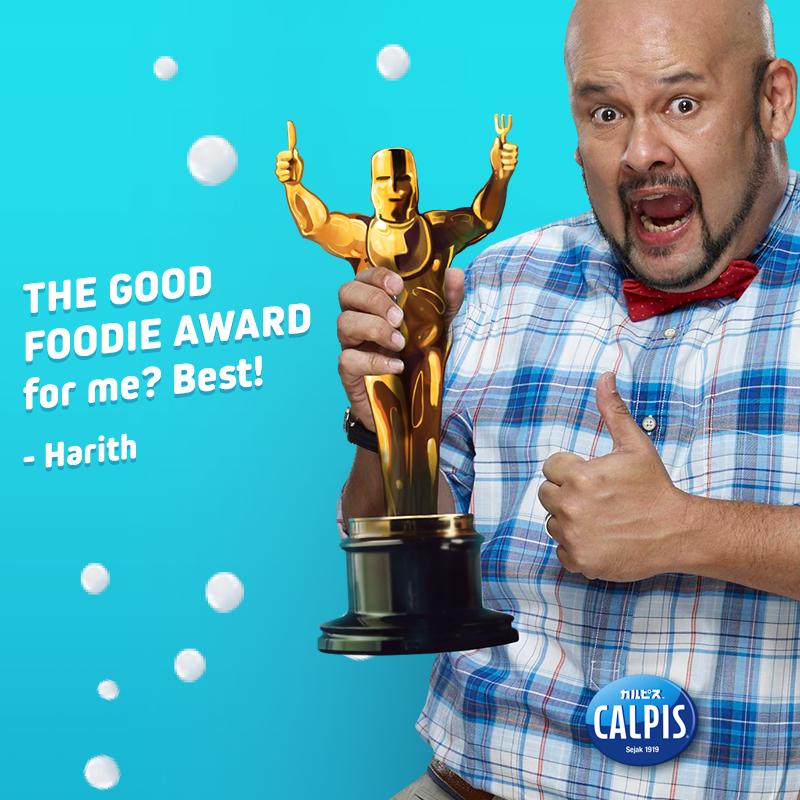 I think it was a brilliant idea to combine a fun element whilst educating Malaysians on the importance of a healthy digestive system and how light one can feel if they maintain a healthy gut”, said Harith Iskander, Laugh Factory Funniest Person in The World 2016. Zizan Razak, actor and comedian said, “Being strapped to helium balloons and lifted up in mid-air is a first for me. It was such a fun and amazing experience to be a part of the ‘FibreUp Challenge’ and I am happy that I got to share it with my fans”. Furthermore, the brand recently launched an additional one-month social media contest. Dubbed the Calpis Fibre-up Challenge, the contest spanned across both Calpis Facebook and Instagram platforms. 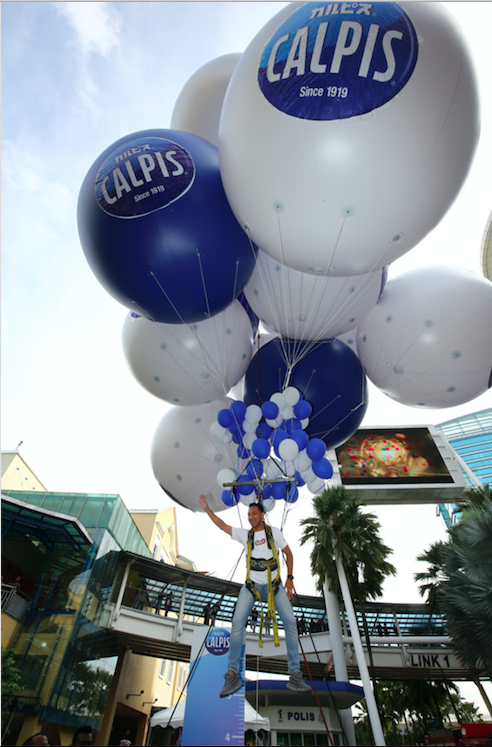 Fans were challenged to share the goodness of Calpis Fibre with less sugar and show how ‘light’ they feel when they consume Calpis Fibre through stimulating or creative physical stunts captured in a photo. Not only did it present them with the chance to express their creativity, but they also multiplied ‘the goodness within’ Calpis by sharing the joy with their peers. The contest received a tremendous amount of creative and imaginative entries on both social media platforms. All-in-all 20 winners were selected as they presented the most fantastic gravity-defying imagery that best represented the Calpis Fibre key attributes. “We are all about promoting a larger social good and helping people understand the importance of ‘multiplying the goodness within’ your internal digestive tract and leading healthier lives. Thus, the Calpis Fibre range and our campaign fits in seamlessly with our brand values” said Santharuban T. Sundaram, Vice President of Marketing at Etika Sdn Bhd. Santharuban added, “More importantly, we understand that fans like to be engaged in fun and exciting ways in order to make a greater long-lasting impact. Hence, we decided to include our very own ambassadors to implement the fun element and to educate Malaysians about the importance of gut health”. Furthermore, Calpis Fibre contains polydextrose, which is a form of dietary fibre that helps increase intestinal bifidobacteria and helps maintain a good intestinal microflora. Polydextrose is well tolerated amongst patients with irritable bowel syndrome (“IBS”) too, and has been known to alleviate IBS and constipation symptoms as well. Now we know the one way to manage our intestinal and digestive health that’s actually simple to do! For more information on Calpis, please visit www.etikaholdings.com.